← What’s with the labels ? Everyone is talking about 6 meals a day for optimal health. The other option being 3 full and healthy meals with no snacks in between. In case you are comfortable with the former, you may wonder how it works? Three full meals plus three small ones or fruits only or what? I would say have your three regular meals with the right foods of course( as mentioned in the 2nd post ‘what do we eat’ ). The rest of the 3 meals can be small ones like snacks. Now that could get a little confounding as most of us may be working at these times. Its good to stick to simple foods for these times simply because one really can’t get the time to really prepare, think of or even eat very complicated or fancy menus six times a day. Fruits , nuts, simple vegetables like carrots or cucumbers (which can be eaten raw),lean proteins,are good options as long as we don’t make them into high sodium foods by adding salt. Yes, sometimes a guava with rock salt is OK, but no point making a habit of adding that. It must be amply clear by now that a snack may consist of one protein and one fruit or vegetable. 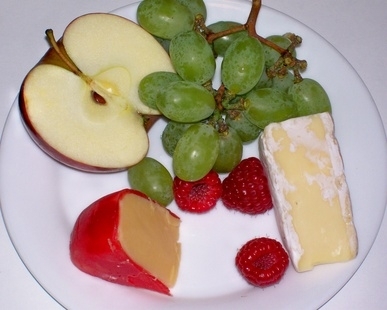 All nuts, cheese, yogurt, are protein sources and all vegetables and fruits are produce. Remember, all will NOT be lost if you snack on a cake/ cookie/ or something else bready once in while. Although 90% of the times sugar, bread or any staple for that matter is not what you would need for a snack. Why? It’s just that we are not athletes to need these for breakfast, lunch, dinner AND snacks! So, if we have simple carbs for breakfast, there is no need whatsoever to repeat the same for any other meal. Whole grain breads and brown rice are good options to consider if there is a ‘dire’ need for them. To make matters more interesting, you can add some healthy flavours like cinnamon with the apple and yogurt, mustard with boiled eggs or even just green tea with cottage cheese and cucumber. In case there is just no time at all, keep a trail mix ( various nuts together like walnuts, almonds, raisins and pistachios) in a zip lock in your bag or on your worktable at all times. Or maybe even a packet of low fat cheese available in the market as cubes or triangles. If eating out of a bag is your only choice, make your own bag in the morning. Buying something from the grocery store marked ‘ low fat’ is not really as simple as it sounds if you read the label for ingredients. By ‘simple’ , i mean ‘not processed’ and usually a food item that is grown in soil, is not heavily cooked or added with too many ingredients. There are just too many really simple foods out there waiting to be made your healthy snack alternatives….just a matter of choosing them. Note : All my Prayers for all people affected by the devastating quake and tsunami in Japan. This entry was posted in Nutrition and tagged fitness, healthy, nutrition, simple, Snacks. Bookmark the permalink.